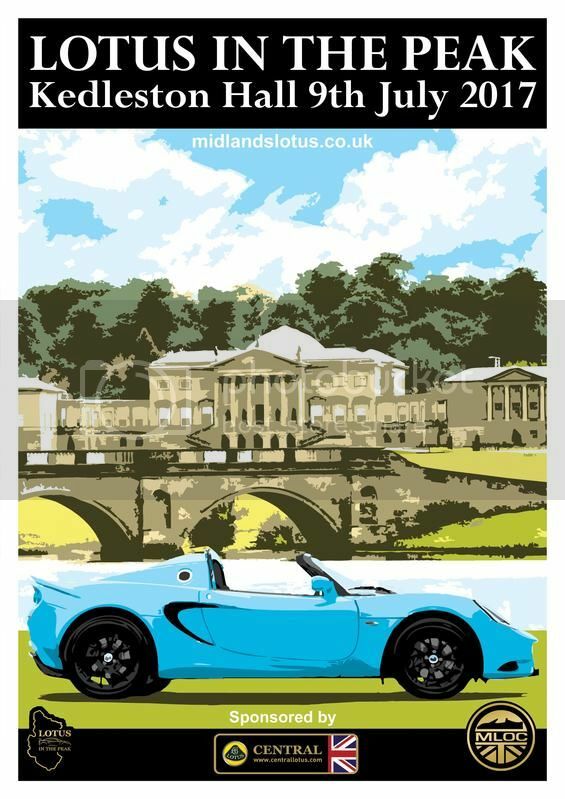 MLOC are excited to announce that we will once again be hosting Lotus in the Peak, which for this year will be on the 9th July 2017 and at a new venue; Kedleston Hall, a spectacular National Trust property approximately 5 miles North West of Derby. Last edited by Phil S1 on Fri 07.07.2017, 05:36, edited 2 times in total. LitP 2017 is now confirmed for Sunday 9th July 2017, with the main event on the lawns in front of Kedleston Hall. The event is having a very similar format to previous years with just a change of location. If you‘ve not been to or heard of Kedleston Hall, then it is an extremely grand country hall about 5 miles north west of Derby set in massive landscaped gardens which lead straight into the Derbyshire countryside. The day will start with drives through the fantastic Derbyshire countryside and Peak district, with a stop for breakfast. Cars will be split up into smaller groups, each with a group leader, enabling people to choose the pace of journey. The drive will then culminate with a procession through the main gates at Kedleston Hall, over the bridge and then parking on our own area of grass in front of the Hall. (You can come directly to Kedleston Hall from around 10:45am if you don’t want to take part in the drive). As with previous years we will attempt to park all the cars in model categories around a central clear area for picnics. We will once again be offering the option of a catered picnic which can be purchased through the MLOC shop at the same time as the event tickets. The popular car of the day competition and the raffle (with extensive lotus related prizes) will be held after lunch. We’ll have children’s activity packs with a colouring competition to help keep little ones entertained. Central Lotus are once again the main event sponsor who will be displaying their race cars and the latest range of Lotus cars. In the afternoon people can carry on chatting to new and old lotus friends or take advantage of a discounted rate of £5 per adult to tour the main house (National Trust members can enter for free) and anyone go on one of the walks around the grounds for free. The event will be for sale in our online shop in the next few days. We also intend to have a meet up on the Saturday night at a local pub, with the venue hopefully announced shortly. Tickets are now on sale in the MLOC store for what we hope will be another great event, with new roads to enjoy and a splendid new venue in Kedleston Hall. Once more we will be having 'car of the day' voted for by everyone, competitions for the kids and of course the Lotus themed raffle with some superb prizes, thanks to our many supporters. Once again we have an extensive array of raffle prizes on offer for this year, thanks to our many generous supporters. Tickets on sale now in the MLOC store and will be available to purchase on the day. A huge thank you to all the above companies for their extremely generous support of MLOC and Lotus in the Peak. The draw will take place on the afternoon of the event. Each winning ticket holder will be given their choice of available prizes. Any winning ticket holder not present at the time of the draw will be allotted the highest remaining item from the prizes as listed above. Once again, at LitP 2017 we will be having a competition for 'Car of The Day' as chosen by you. All attendees on the day will receive a voting slip which we kindly ask you to complete and hand in during the morning. There are no competition rules other than the car must be a Lotus, previous winners have been both classic and new, ranging from an Eleven to an Exige Sprint. There will be trophies for the top three cars, sponsored once again by PJS Sports Cars. Just when you thought the raffle prize list was complete we now have another TWO prizes on offer. Thanks to both companies for supporting our event this year. Only 2 weeks to go until the big day! Also please note the MLOC store will close on the Wednesday prior to the event - Wednesday 5th July so be sure not to miss out. Anyone else is of course most welcome to arrive in their Lotus direct to Kedleston on the day and pay £10 on entry. There's still time to book onto one of the runs, pre-order breakfasts and the catered picnic at Kedleston and reserve raffle tickets but the shop will be closing at 6:30pm on Wednesday 5th July. After this date anyone else will of course be most welcome to arrive in their Lotus direct to Kedleston on the day and pay £10 per car on entry. Raffle tickets can be purchased on the day too.